– I returned to my yoga practice. My building offers classes on Saturday morning and so I decided to not go out on Friday night, opting to work until 1:30 am. This positioned me to wake up without a hangover and with the desire to head upstairs so I could work on my tree pose and warrior two. Namaste. 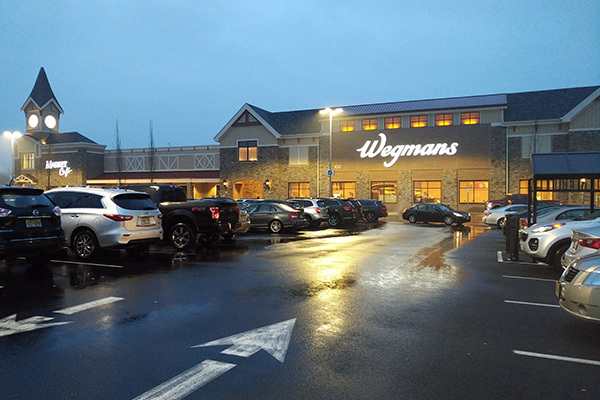 – I finally visited the new Wegmans in Montvale. Oh, my, goodness. From the Burger Bar to the cookie bar to the sheer expansiveness of the store, it was worth the trip and then some. For those who don’t know, my first ever job was Front End Cashier at the Wegmans in the Town of Niagara, 17 years ago. Wow, that makes me feel old. Anyways, I stocked up on everything, including alcohol because Wegmans’ adjacent wine, beer and liquor store is equally fantastic. – I had my second appearance of the year with 95.5 PLJ at T-Mobile in Mohegan Lake, New York. I loved visiting the northern part of Westchester County and hope to return soon; some of the mom-and-pop restaurants along the way looked like they served up some delicious food. – I surprised my friend Ashley at a comedy show she was added to Sunday night in the East Village. I hadn’t seen her since she moved from Los Angeles almost a year ago to continue pursuing stand-up. She was fantastic and it was also pretty cool that I got to introduce her to Kelly’s – a Buffalo Bills and Sabres bar but also a Chicago Cubs and Bulls watering hole (she’s originally from Chicago and is a diehard Cubs fan). – As for that aforementioned warm weather, it afforded me the opportunity to run outside Sunday, and I am beyond grateful for that. From the physical ability to run, to living in Manhattan where we have a plethora of amazing routes, to the fact that I didn’t have to bundle up because by the time I finished it was 60 (!) outside – it was a nice way to lead in to Sunday night and close out what was a great weekend.